Thirty years ago, when he was employed in the controller's office of Rutgers U in New Jersey, Ken Raymen cut back to half-time work so that he could volunteer half-time at an elementary school. "I've been doing it ever since," says Raymen, who was recently named volunteer of the year in Springfield schools for his efforts at Page Elementary. When he moved to Eugene in 1986 -- "My brother has lived here since '71" -- Raymen imported a program of intra-school team competitions that he had developed in New Jersey. During the 90s, Raymen organized "Teamwork" contests at four Eugene elementary schools. "I was doing the whole thing myself," he notes. "Eventually I burned out." 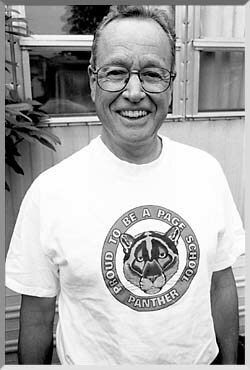 After a move to Springfield, he began volunteering at the Page School library in 2000. "Then they asked, 'How about doing lunch recess?'" he notes. "I get to see all the kids -- I love that." During the past school year, Raymen has founded a non-profit corporation, We All Win, Inc., to organize supplementary educational programs in the Springfield district. "Ken is a pretty awesome guy -- we love him," says Page principal Carole Sterry. "He also gets other people to volunteer."